Thousands of wild purple crocus in a protected field in the little village of Inkpen. This is a BBOWT nature reserve but one not may people know about. This field is tucked away between two houses in Inkpen, west of Newbury. 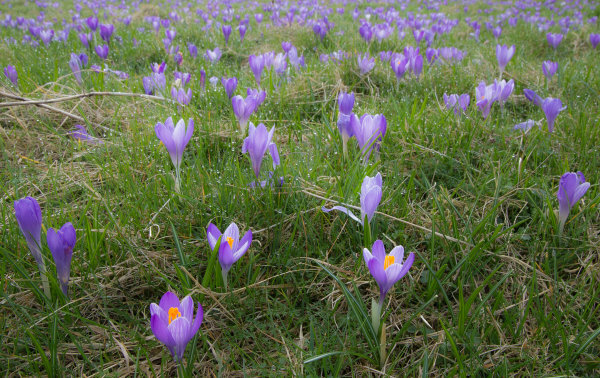 No-one knows how the crocus got there but legend has it they were brought by the Crusaders in the twelfth century, or perhaps more believable, they are garden escapees that have multiplied over hundreds of years. Most are purple or mauve with a few white ones in between. I visited on a misty morning with just enough brightness for the mauves and purples to glow in the morning light and with a sprinkling of sparkling dewdrops. Apart from a couple who left after a short time, I had this wonderful field to myself.